Join us at one of our upcoming events and be sure to check out the Women Lead blog for event recaps and content. Interested in volunteering with Women Lead? Email volunteer@portland.aiga.org to learn about current opportunities. Want to sponsor, support or partner with Women Lead? Email womenlead@portland.aiga.org to contact us. 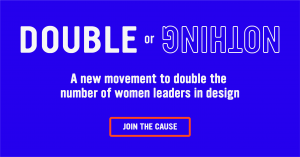 Tag your tweets, images, and posts on social media with #AIGAwomenlead to help our initiative celebrate and foster women’s achievements in design.